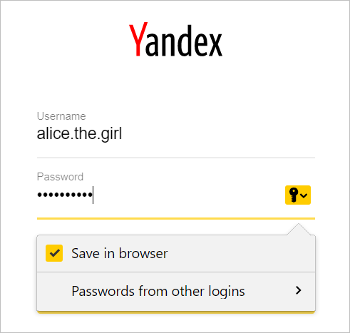 When you enter a password on a website for the first time, Yandex Browser asks if you want to save it. When you visit this website in the future, your saved password will be entered for you automatically. By default, the browser remembers the password you have entered on a site. If this is not what you want, turn off the Save in browser option, which opens under the box when you enter the password. If you enter a password with no username into a form, the browser suggests earlier saved usernames. If you previously created a master password, you will need to enter it. A master password is used in the encryption algorithm and ensures a higher protection level, since it is stored only in your memory. It is harder to hack automatically generated passwords. You don't need to memorize them: the manager puts the password into the form automatically, and you can view it anytime you wish. To protect passwords in the vault, use a master password. In the drop-down list, click the generated password. If you already created a master password, enter it in the window that opens. In the tab that opens, click the Settings link to the left of the password list. 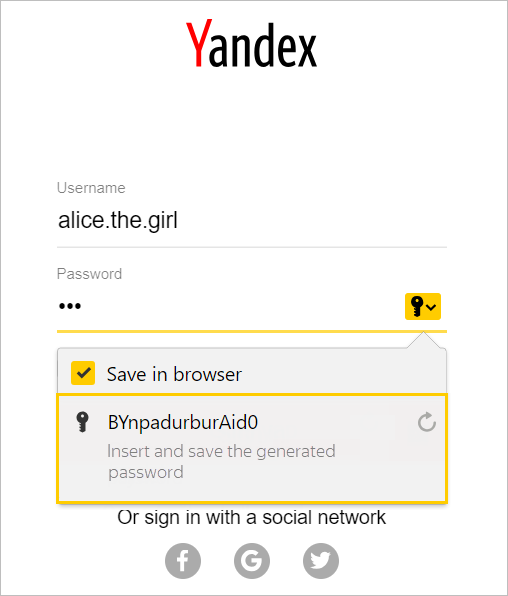 Allow sites to save passwords in the browser and log you in automatically. 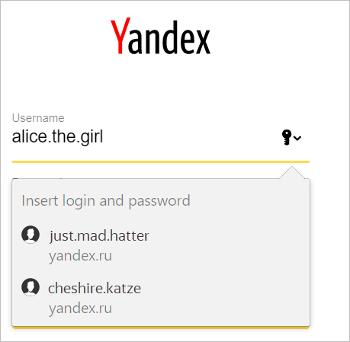 Some sites (those that support the CredentialManager API) let you log in without a password. That way you can log in just by clicking and selecting your username. If you want to disallow automatic authorization, disable this option. 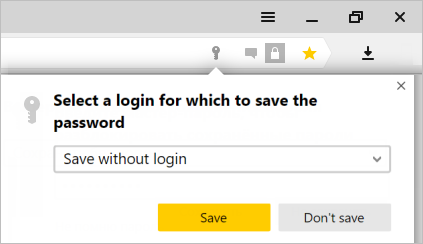 Save passwords by default — if you turn off this option, the browser will not save passwords you enter from now on, but will insert passwords you saved earlier in authorization forms. Auto-fill login forms — if you turn off this option, the browser will not insert usernames or passwords into authorization forms. If this option is turned on, you can allow the browser to insert both your usernames and passwords in forms, or only your usernames.